If you are a current parent, alumni, or employee of Cape Henry Collegiate, please CLICK HERE for information on how to apply. 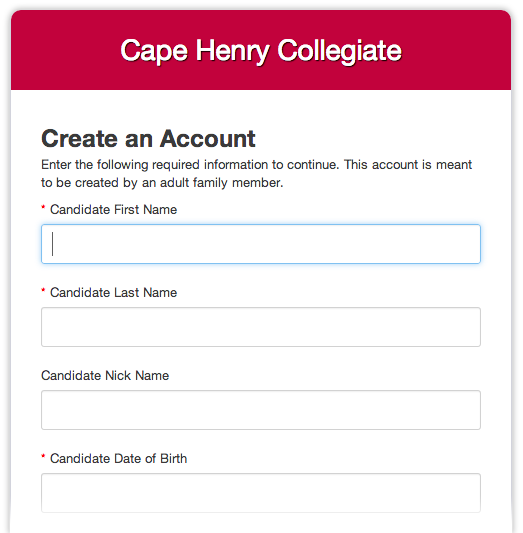 If you are new to the Cape Henry family, please CLICK HERE to begin the Online Application Process. Create an account. Enter candidate information and create your username and password. Finally, click Create Account. After you establish the new account, you will receive an email with a link to set your password. After you set your password, you will be directed to the online application. After you complete payment and submit the application you will return to the Admissions Progress page. If you need to apply for an additional child, Click on Apply Another Candidate in the right column. A member of the Admissions Office will contact you shortly. You will also receive a confirmation email. If you have any questions at any point during the online application process, please do not hesitate to contact the Admissions Office at (757) 963-8244.